It was my second day in Kiev, and I was getting a bit frustrated. Usually when I travel I make new friends quickly, I always end up talking to people I meet in bars or restaurants. In Kyiv I found this not so easy. People generally spoke little English, and many locals seemed generally uninterested in talking to tourists. I had found Nikka Cocktail Bar the night before, I was on my way home, but passing a Japanese cocktail bar I knew I had to visit. Since it was christmas it closed early, there were no other people there except the bartender and his girlfriend. I only had time for one drink. Still I got a good feeling in the bar. The bartender spoke better English and seemed friendly and interested in making conversation. I knew I had to visit again. The next day there were a lot more people visiting, and three bartenders at work. The seats at the bar were all taken, but as previously mentioned the bartender quickly cleared a place for me. They didn’t have beer, I started with a glass of whisky before I moved on to cocktails. It was clear the bartenders loved what they were doing, the cocktails were very good, and I was always recommended something to my taste. I don’t usually drink much cocktails, I am more of a beer guy, and the bars I usually go to don’t always mix up the best drinks, but at Nikka Bar I found some very good cocktails, the bartenders even improvised and made me some they thought I would appreciate. I really did. The bar itself consists of two rooms, one in the front with the counter and the bartenders, and another room in the back with tables and sitting groups. 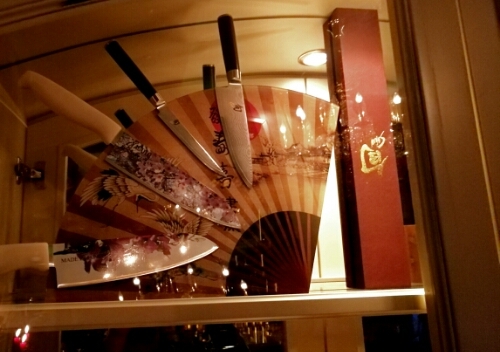 The place is packed with Japanese memorabilia, mainly katanas and items connected to samurai and swordmaking. It mainly serves cocktails and whisky, and also has a small food menu. The Japanese Whisky they have is all from the Nikka distilery, they also have a good selection of whisky from other countries. The Japanese kind can be a bit more expensive. For cheaper drinks they mic with cheaper whisky. I returned to Nikka Bar on my last night in Kyiv as well. 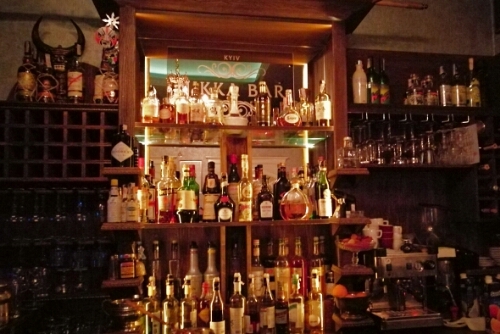 It was Orthodox Christmas Day, a lot of places were closed, but Nikka Bar was not only open, it was quite crowded. I stayed there until they closed at 2 am, even got chance to try some sledding, and went home a very happy man. I found Kyiv to be an amazing city, and Nikka Bar to be a great bar. If you ever are visiting Kyiv, I advise you to drop by. I love that you travel but get to know the locals. This bar sounds very cool. My husband was immediately intrigued when he saw whisky. Did you enjoy any cocktails you never tried in the states? The whisky was also very good. I love Japanese whisky! I love checking out little European bars!!! !